St Mary’s Roman Catholic Church in Derby, built 1838-39, was the first complete design of the foremost designer of the English Gothic Revival, Augustus Welby Northmore Pugin (1812-1852). Its foundation stone was laid on June 28th 1837, the day of Queen Victoria’s coronation. Previously the few Catholics in Derby had worshipped in a small building in Chapel Street. Built to the north of Derby town centre, at precisely the time when the approaching railways were about to cause rapid growth in population, St Mary’s was an acknowledgement that many of the workers who would migrate to the new railway works would be Irish in origin. The site was constricted and funds limited. Pugin set out the building with the sanctuary to the north and a tall tower, 100 feet high, placed centrally at the south (liturgical west) front. The church would have been even more prominent if Pugin’s slender spire, supported by flying buttresses, had been built: its tip would have reached two hundred feet above street level. In the absence of a spire, a white Portland stone statue of St Mary was mounted on top of the tower and unveiled on Trinity Sunday 1928. Now that many of the surrounding buildings have been cleared the plainness of the side walls is noticeable. Though the exterior of St Mary’s is elegant and understated, the interior was richly decorated. Pugin designed a whole range of fittings and metal furniture in collaboration with the Birmingham manufacturer, John Hardman. The panoply of lamps, crosses, candlesticks, vessels and altar furniture first seen at the consecration ceremony were the earliest products of a partnership which lasted to the end of the architect’s life. The Derby Mercury reported that “the appearance of the clergy, upwards of fifty in number, surrounding the Altar, was extremely gorgeous”. The Catholic newcomers were not welcomed to Derby by the established Anglicans. In 1846 the great bulk of the Anglican parish church of St Alkmund, designed by the local architect Henry Isaac Stevens (1806-1873), was built, blocking the view of St Mary’s from the town centre. It was traditionally said to have been the “Anglicans’ revenge” for the construction of Pugin’s church. Ironically, when St Alkmund’s was demolished in 1967 to make way for the Inner Ring Road, some of its stone was offered for the construction of a new East Porch for St Mary’s. The footbridge across the underpass leads directly to St Mary’s main entrance, and there is now an unimpeded view between Pugin’s elegant Gothic Revival church and the superb medieval Perpendicular tower of the Anglican cathedral of All Saints’. St Mary’s Church is listed Grade II*. A guided tour of St Mary’s Parish Church is included in the Pugin and the Gothic Revival (September 18th-22nd 2019) tour. For details please click here. This entry was posted in Pugin and the Gothic Revival, Sacred Places, Survivals & Revivals: past views of English architecture, The Derbyshire Derwent Valley, Victorian Architecture on January 9, 2019 by Mike Higginbottom. One of the best free shows in the Peak District National Park, in rainy seasons, is the bell-mouth spillway beside the A6013 road that skirts Ladybower Reservoir, the biggest of the three Derbyshire Derwent valley reservoirs. The original Derwent Valley water scheme of 1899 envisaged six reservoirs but only two of these, Derwent and Howden, were built. The engineer, Edward Sandeman, pointed out that repositioning the Derwent Dam slightly further upstream would dispense with the need for the top dam, Ronksley. Geological problems in the tributary Ashop valley led to the abandonment of the other three dams, Hagglee, Ashopton and Bamford, which were superseded by a single huge reservoir, contained by a dam at the next available nick-point, Yorkshire Bridge. This great dam, named Ladybower after a local farm, was begun in 1935. It drowned two villages, Derwent and Ashopton, and was so badly needed that construction continued without interruption throughout the Second World War. It was opened by King George VI and Queen Elizabeth on September 25th 1945. Designed by G H Hill & Sons of Manchester, and constructed of earth around a clay core by Richard Baillie & Sons, East Lothian, the dam is 416 yards across. Its trench and embankment required 100,000 tons of concrete, 1,000,000 tons of earth and 100,000 tons of puddled clay. Unlike its predecessors at Derwent and Howden, which spill their excess water over the stone sill of the dam, at Ladybower the dam has a clay core and a grassed slope downstream. 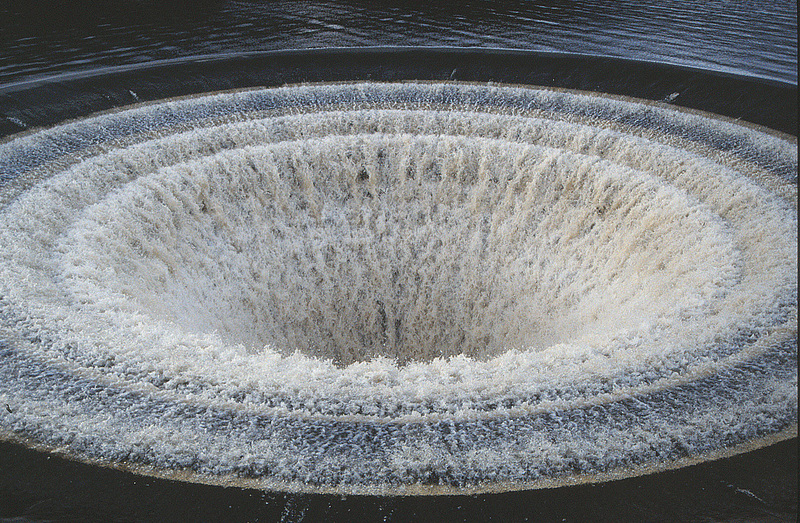 The overflow water is directed into two bell-mouth spillways, which from above look for all the world like plugholes, but are actually shaped like ear-trumpets, 80 feet across at the rim, tapering to a 15-foot pipe that emerges at the foot of the embankment. This footage brings the still picture to life: https://www.youtube.com/watch?v=cg-mjoLm1Jo. In-depth explorations can be found at https://www.youtube.com/watch?v=GqXGM_L7Zp0 and https://www.youtube.com/watch?v=q5BVsk9o9hw. This entry was posted in Cemeteries, Sewerage & Sanitation, Life-enhancing experiences, The Derbyshire Derwent Valley, The Derbyshire Derwent Valley 2016 tour on February 4, 2016 by Mike Higginbottom. The Manchester, Buxton, Matlock & Midland Junction Railway, the little railway with the long name, was an ambitious project to connect the East Midlands with Lancashire, starting at a junction with the North Midland Railway at a place called Toadhole which the railway renamed Ambergate. The MBM&MR opened in 1849 through Cromford and Matlock as far north as Rowsley, where the Duke of Devonshire’s Chatsworth estate bounds the Duke of Rutland’s Haddon estate. The intention, had there been sufficient capital, was to continue up the Derwent Valley, tunnelling beneath Chatsworth Park, towards Baslow, Edale or Castleton and Chinley to Cheadle. The 6th Duke died in 1858, and his successor had no intention of letting a railway through Chatsworth. 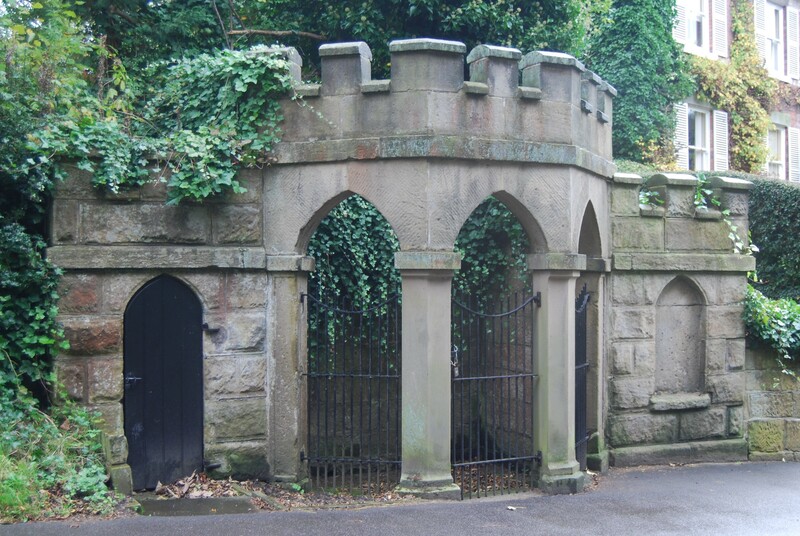 As it happened, the 5th Duke of Rutland died in 1857, and his successor was prepared to allow the Midland Railway to build a cut-and-cover tunnel at the back of Haddon Hall which was at the time practically derelict. The Midland line to Manchester consequently went up the Wye Valley, through Monsal and Miller’s Dales on its way to Chinley. 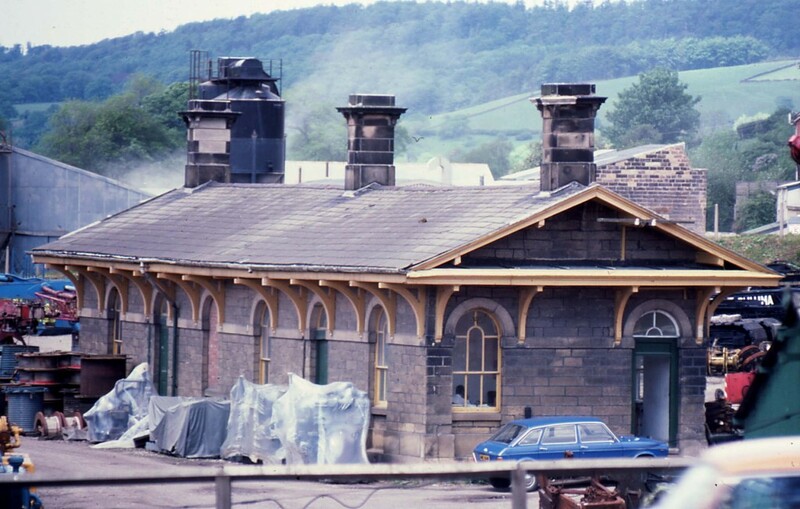 And the original Rowsley station, designed by Sir Joseph Paxton, was left at the dead end of an unbuilt main line, made redundant by a new Rowsley station a few hundred yards away. The old building survived as the goods office for sidings known as ‘The Old Yard’, and was the very last rail facility to close in Rowsley in July 1968. After the railway closed the Old Yard was occupied by a construction company, and in 1999 the old station became a feature of the Peak Village shopping outlet: http://www.peakshoppingvillage.com. The original MBM&MR track is now operated from Matlock to just short of Rowsley by PeakRail, with the ultimate intention of extending the heritage railway through Haddon to Bakewell and beyond. The 56-page, A4 handbook for the 2010 Waterways & Railways across the Derbyshire Peak tour, with text, photographs, maps, a chronology and a reading list, is available for purchase, price £15.00 including postage and packing. To view sample pages click here. Please send a cheque, payable to Mike Higginbottom, to 63 Vivian Road, Sheffield, S5 6WJ. This entry was posted in The Derbyshire Derwent Valley, The Derbyshire Derwent Valley 2016 tour, Transports of Delight, Victorian Architecture, Waterways & Railways across the Derbyshire Peak on October 19, 2015 by Mike Higginbottom. All the mileposts on the Trent & Mersey Canal measure the distances between Preston Brook, at the Mersey end of the Canal, and Shardlow, the Derbyshire inland port where goods were trans-shipped between the canal barges and the bigger river boats that plied the River Trent. The Trent & Mersey Canal was built between 1766 and 1777, and was open between Shardlow and Stafford by 1770. Its surveyor, James Brindley, died of overwork in 1772, and the responsibility for the canal passed to his brother-in-law, Hugh Henshall. Not only did the route of the new canal lie beside the river at Shardlow, but the turnpike road that formed part of the route between London and Manchester (later the A6 road) crosses the river a few hundred yards away at Cavendish Bridge, built for the 4th Duke of Devonshire by James Paine, and swept away in a flood in 1947. The ancient village of Shardlow lies some way to the west of the canal, so the waterside buildings grew very quickly around the road bridge and the Shardlow lock. 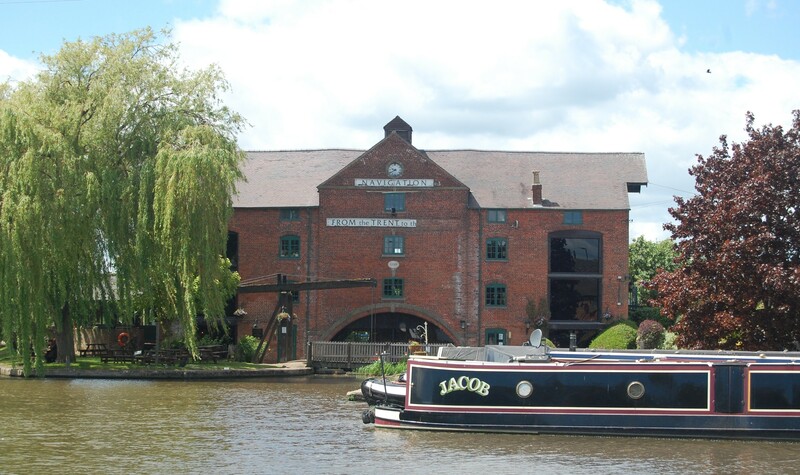 As such it presents a collection of eighteenth-century industrial buildings, houses and inns to rival the more famous Stourport on the River Severn. …so many merchants’ houses, wharfs etc, sprinkled with gardens looking upon the Trent and to Castle Dunnington Hill as to form as happy a scenery of business and pleasures as can be surveyed. Indeed, the place was known colloquially as “Little Liverpool”. Its heyday was over by the mid-nineteenth century, though the North Staffordshire Railway maintained the Trent & Mersey Canal as a means of extending their catchment area for freight. Most of the warehouses were adapted, particularly to store corn. The last grain traffic on the canal ceased in 1950, and the port became moribund. The canal stables and the brewery were demolished, and much more might have been swept away during the 1970s but for the creation of the Shardlow Conservation Area in 1975. Now the canal warehouses are back in use for boat-building, housing and leisure. The Clock Warehouse is a busy pub [http://www.clockwarehousepub.co.uk], and the Navigation Inn, which has been an inn since 1778, is a particularly fine place to eat and drink: https://www.facebook.com/navigationinnshardlow. This entry was posted in The Derbyshire Derwent Valley 2016 tour, Transports of Delight on August 14, 2015 by Mike Higginbottom. 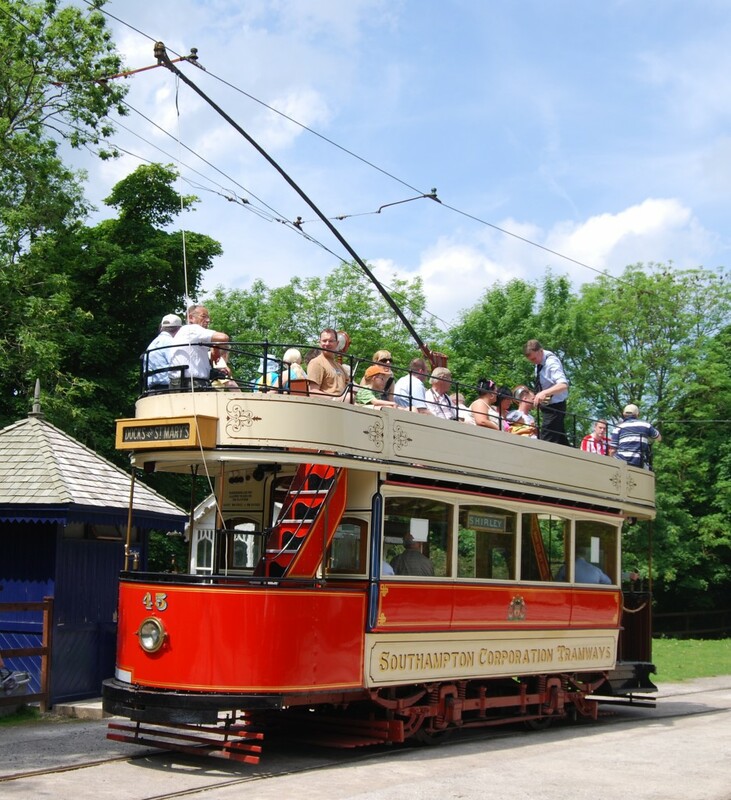 In the extensive fleet of preserved trams at the National Tramway Museum at Crich, Derbyshire, none is more precious than Southampton 45, a 1903 open-top double-decker which was designed specifically to fit the medieval Bargate in the centre of Southampton. It survived thanks to members of the Light Railway Transport League (now the Light Rail Transit Association). The League had been founded in 1937 to campaign for the retention of light rail as urban and interurban transport, but witnessed the inexorable decline of street tramways in Britain before their eventual renaissance at the end of the century. During a farewell tour of Southampton tramways in 1948, a group of League members took the opportunity to buy 45 for £10, despite the lack of anywhere to store, let alone display it. Through the 1950s, Southampton 45 led a peripatetic existence, first stored in a tram depot in Blackpool and then displayed in the open air at the Montagu Motor Museum in Hampshire. 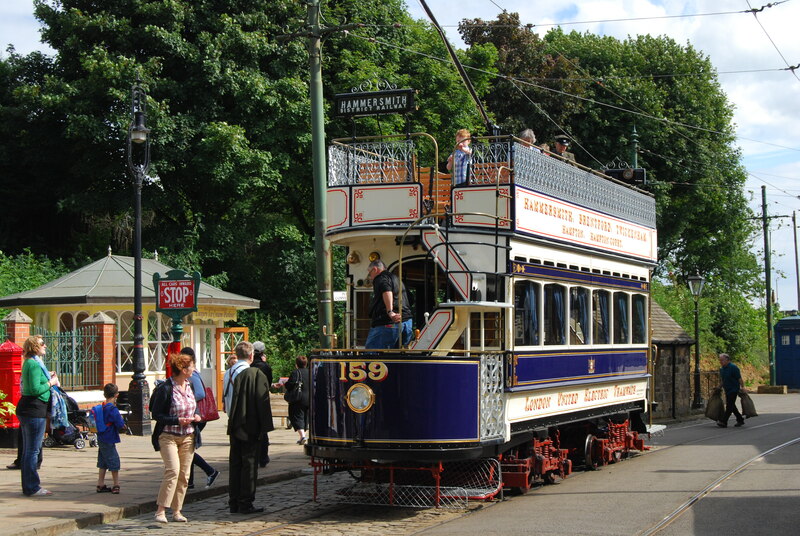 When the Crich site became available 45 at last had a permanent home, and now forms part of the running fleet of this splendid museum, the very first British tram to be preserved. Subsequently, three more Southampton trams have been rescued. Two of them are being restored by the Southampton District Transport Heritage Trust. This entry was posted in The Derbyshire Derwent Valley, Transports of Delight on June 14, 2014 by Mike Higginbottom. One of the most attractive Derbyshire places to visit for morning coffee, lunch or afternoon tea is Caudwell’s Mill at Rowsley, a few minutes’ drive from Chatsworth or Haddon Hall: http://www.caudwellsmill.co.uk. The mill itself was built to produce flour and animal feed by John Caudwell in 1874, and he and his son Edward modernised it by replacing the original millstones with roller mills to make finer, purer flour for baking, and installing water turbines to power them. The last phase of this installation, by the manufacturer Amme, Giesecke & Konegen, was in progress in August 1914: the German labourers were promptly sent home but the engineers, having finished their work, were apparently interned in the Isle of Man until 1919. Edward Caudwell eventually settled the bill in 1924. Caudwell’s ran as a going concern until 1977, by which time it was recognised as an intact, complete example of a distinct phase in the development of modern milling technology. It was listed Grade II* and taken over by a trust with support from the landowner, the Duke of Rutland’s Haddon Estate, the local planning authority, the Peak Park Planning Board, and a small army of local people, industrial archaeologists and millers with financial assistance from, among others, the Architectural Heritage Fund, the Carnegie (UK) Trust, the Countryside Commission, the National Heritage Memorial Fund and the Science Museum. The mill itself is open to the public, a fascinating warren of band-driven machines, hoists and Archimedean screws. One of the turbines generates the electricity for the site. The mill shop sells flour, oats and yeast – everything you need for quality home baking. 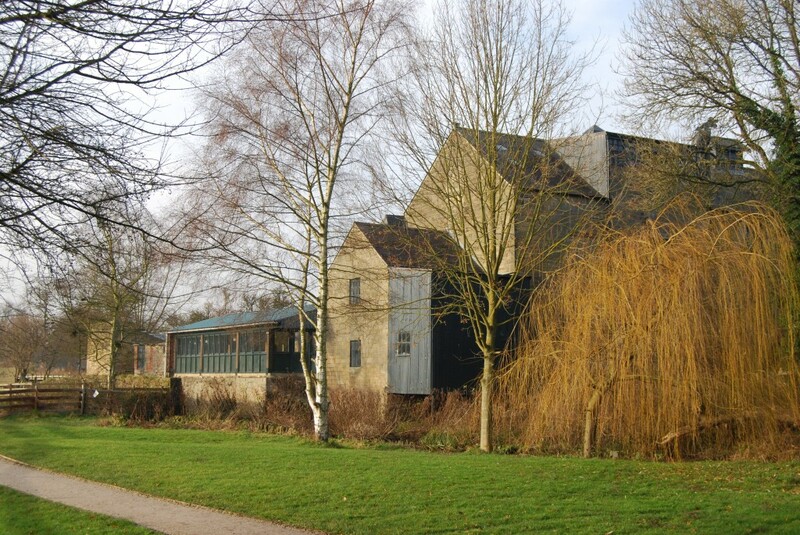 In the surrounding yard are craft-shops, a blacksmith, an upholsterer, a glass-maker and a jewellery maker: http://www.caudwellsmillcraftcentre.co.uk/Thecraftcentre.htm. The café is vegetarian and provides the sort of cream cakes that look as if they’d qualify as five-a-day: http://www.caudwellsmillcraftcentre.co.uk/Thecafe.htm. All this lies beside the waters of the River Wye, in one of the most beautiful of Derbyshire valleys. This entry was posted in Life-enhancing experiences, The Derbyshire Derwent Valley, The Derbyshire Derwent Valley 2016 tour on May 21, 2014 by Mike Higginbottom. The National Tramway Museum, like all good tourist sites, needs novelties to encourage visitors to return repeatedly: http://www.tramway.co.uk/plan-a-visit/opening-times-prices-2013. This year’s pride and joy is London United Tramways no 159, built in 1902 and now newly restored after twenty-one years of service in London and fifty-five years as part of a residence in Surrey. It was originally used on the routes out to Twickenham, Hampton and Hampton Court, where expectations were understandably high, so this W-class tram was one of the LUT’s “Palace cars”, its palatial lower deck fully fitted in a manner thought suitable for its upper-class passengers, with an inlaid walnut ceiling, plush carpet, velvet curtains and upholstery and silk tassels instead of leather hanging straps. 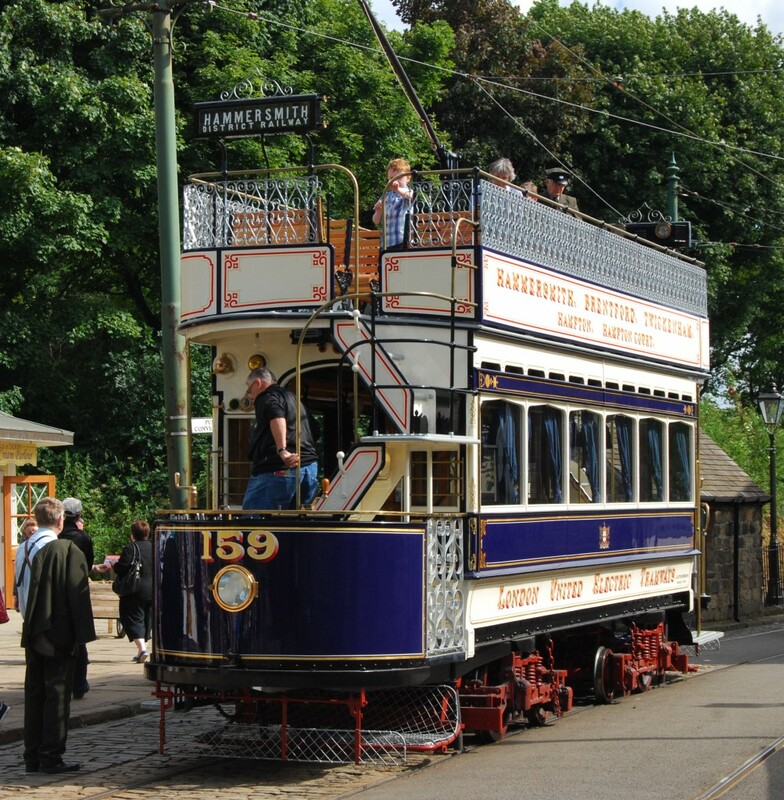 The National Tramway Museum, in conjunction with the London County Council Tramways Trust and the Arts Council’s Prism Fund [Preservation of Industrial and Scientific Material], has spent £400,000 on bringing 159 back to its glorious original condition. The original cost in 1902 was £669. It’s the biggest restoration project the Museum has tackled so far. The London County Council Tramways Trust’s album of the restoration of 159 shows how much work is needed to turn a recovered tram body back into an operational vehicle: http://www.lcctt.org.uk/159m.htm. A smaller but more comprehensive gallery is at http://www.culture24.org.uk/history-and-heritage/transport/trains-and-railways/art392208. This entry was posted in The Derbyshire Derwent Valley, Transports of Delight on January 26, 2014 by Mike Higginbottom. 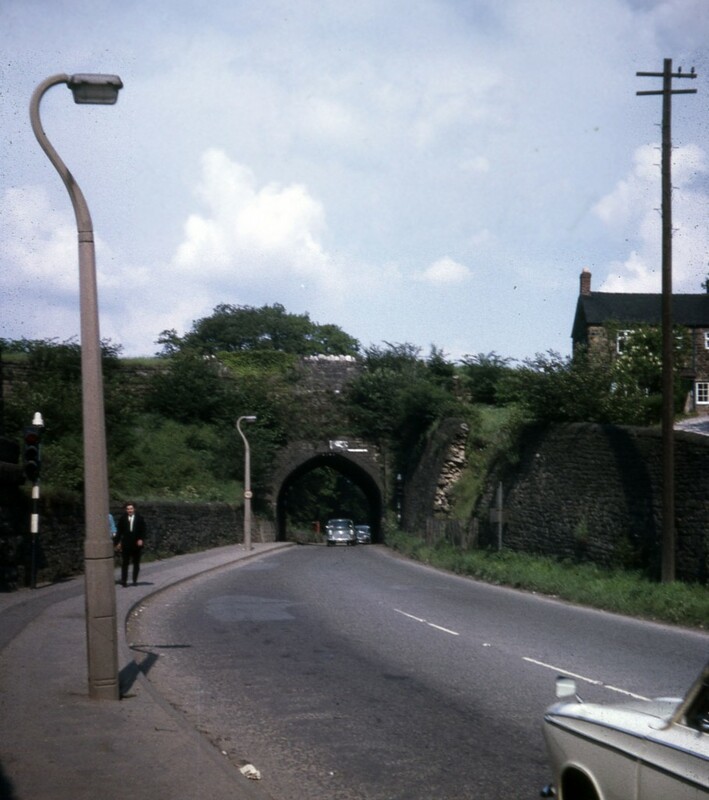 My journeys to school in the early 1960s were punctuated by a pause on the road through Bull Bridge, near Ambergate in Derbyshire, for the traffic lights that controlled the tight gothic arch of Bull Bridge Aqueduct on the Cromford Canal. The canal had not been used since before the Second World War and the arch was impossible for any vehicle larger than a single-deck bus. The A610 road was already a significant link in the 1960s, and would become more important when the Ripley by-pass was opened in 1977. It was inevitable, therefore, that Jessop and Outram’s tiny road-arch had to go. It was demolished in 1968 – shortly followed by the adjacent iron-trough aqueduct that had been inserted into the canal when George Stephenson drove the North Midland Railway through in 1839. Images of the canal at Bull Bridge can be found at http://www.cromfordcanal.info/archives/bullbutt.htm. In the 1960s no-one in their wildest dreams would have expected the Cromford Canal to be restored, but the Friends of the Cromford Canal plan to return the whole canal to navigation, however long it takes, and so one day an elegant new aqueduct will span the road and the railway, rather like the New Semington Aqueduct (2004) on the Kennet and Avon Canal: http://en.wikipedia.org/wiki/New_Semington_Aqueduct. This entry was posted in The Derbyshire Derwent Valley, Transports of Delight, Waterways & Railways across the Derbyshire Peak on January 23, 2014 by Mike Higginbottom. 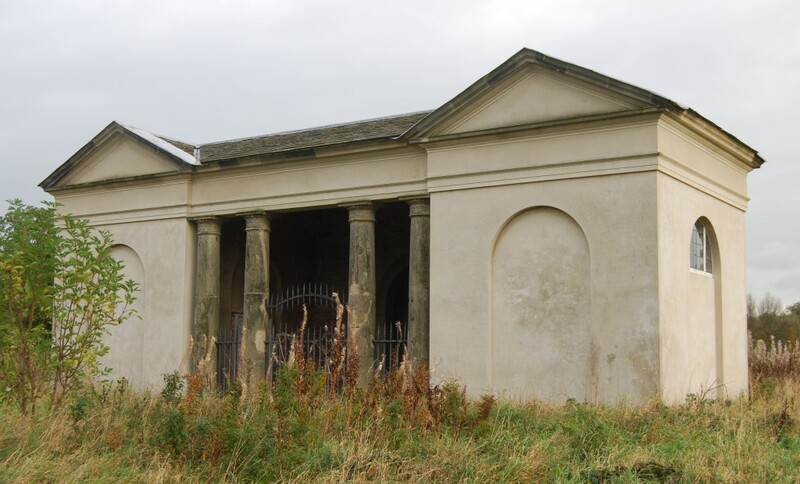 My Taking the Waters: the history of spas & Hydros guests who didn’t think much of Quarndon Spa didn’t have the chance to see its upmarket neighbour, the Kedleston Bath House, because it’s in the middle of a golf course. For clients who might scorn the “wretched lodging and entertainment” in the village of Quarndon, Sir Nathaniel Curzon of Kedleston Hall built the New Inn, now the Kedleston Inn (1761), on the stretch of new turnpike road that enabled him to extend his parkland. 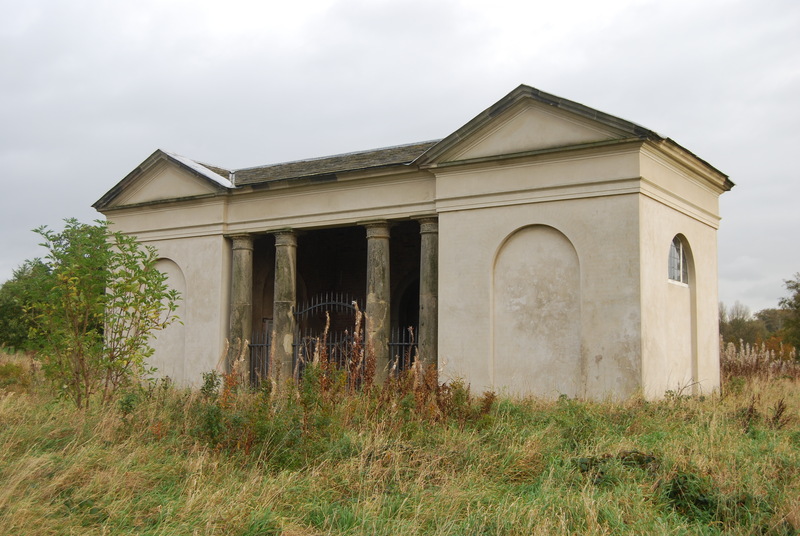 As part of this development Sir Nathaniel built the classical bath house, designed by Jason Harris (Matthew Brettingham’s assistant), over a sulphur spring in Kedleston Park, about half a mile from the Quarndon Spa, with segregated baths and changing rooms divided by a central hall and entered through a recessed portico. The baths themselves were originally overlooked by a statue of Aesculapius, the Greek god of medicine. Persons of a weak and relaxed habit have been much benefited by the use of this water. After drinking it a few days they have found their spirits and strength return in a surprising manner, and in the space of a month a cure has been entirely effected. By visiting the two nearby springs, visitors had a choice of drinking chalybeate (iron-bearing) or sulphurous waters according to their perceived needs. Neither sounds a lot of fun. The bath house, reduced to half its original depth in a 1925 restoration, is particularly difficult to see. Access to the actual building requires permission (and the key) from the National Trust office at Kedleston Hall. The 72-page, A4 handbook for the 2009 Derbyshire-based Taking the Waters: the history of spas & hydros tour, with text, photographs and a reading list, is available for purchase, price £15.00 including postage and packing. To view sample pages click here. Please send a cheque, payable to Mike Higginbottom, to 63 Vivian Road, Sheffield, S5 6WJ. This entry was posted in Fun Palaces, Taking the Waters: the history of spas & hydros – Derbyshire, The Derbyshire Derwent Valley on January 22, 2014 by Mike Higginbottom. When I took the tour-group on the Derbyshire Taking the Waters: the history of spas & hydros programme on a whistle-stop tour of the lesser spas of the county, I’d no idea what their expectations might be when we reached Quarndon Spa. One or two people were a little disappointed with what looks like a Gothic bus-shelter. In fact, its inconsiderable size is what makes it interesting. In the days before science gave us ample solutions to many maladies, those who could afford it (or gain charity) would travel long distances and put up with privations in the hope that the mineral qualities of a particular spring would bring relief. The adjacent pub, the Joiner’s Arms, is first recorded in 1702, and was run by one family for nearly three hundred years to 1928. The last survivor of that family was Miss Helen Hampshire, who died on July 16th 1972, aged 102. Quarndon lost out in the nineteenth century to nearby Matlock Bath, and to Buxton in the north of the county, because its waters were cold and no railway came near it. The spring disappeared as a result of successive earthquakes in 1863, 1895, 1903 and 1956, but the pub survives [http://www.pub-explorer.com/olpg/joinersarms/quarndon/index.htm] and the little spa house is maintained by the parish council. You could easily drive past it without even noticing, yet its history has much to say.